The in-game value of WoW Tokens jumped to a record high this past week after Activision announced that Destiny 2 would be available on PC exclusively through Blizzard’s game client. The news meant a lot of things. PC players would be able to chat with Destiny 2 players while in a Hearthstone or Heroes of the Storm match by using Battle.net’s (recently re-branded Blizzard Launcher) messaging system. 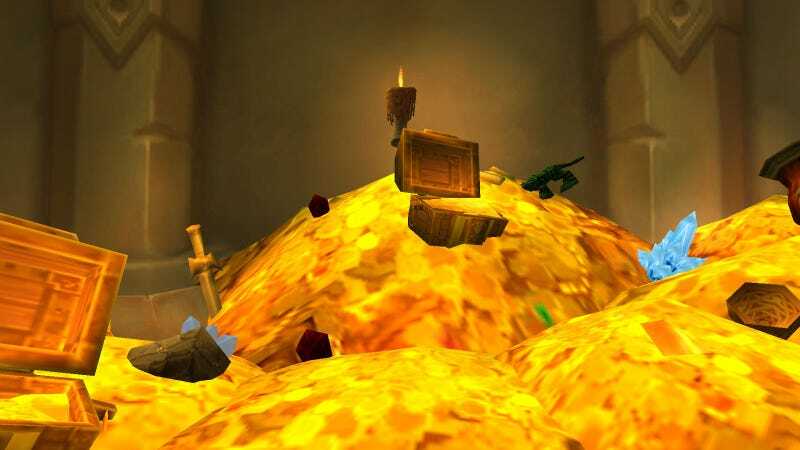 In addition, Activision would be able to avoid giving Steam a cut of of the sales by distributing it through its own storefront (since it and Blizzard are both part of Activision Blizzard, Inc.) But it also meant that the exchange rates between WoW Tokens and in-game WoW currency would be thrown into chaos as players realized they could now use their gold from the MMO to eventually buy Destiny 2. In the World of Warcraft economy, players can buy WoW Tokens priced at $20 each and then trade them in auction houses for in-game currency. If you were someone who had more money than time and didn’t want to grind for gold, WoW Tokens offered a way to tap into the game’s marketplace directly with a credit card number rather than by mashing cool-downs for hours at a time. Those tokens could originally only be redeemed by the people who traded in-game gold for them for another month’s subscription to the MMO, a value of $15, but in February of this year Blizzard changed how the tokens function, allowing players to redeem them for $15 in Blizzard Launcher (aka Battle.net) credit as well. All of the sudden, WoW Tokens became a whole lot more valuable, leading to a spike in the amount of gold they could buy via the auction house as dedicated players looked to unload some of their excess gold for other Blizzard products, ranging from Hearthstone card packs to Overwatch loot boxes. Data via WoW Token Info. After the announcement in early February, WoW Tokens shot up to 111,269 gold each before leveling back out at a new floor of around 80k. The price had been slowly rising over the past few months until the Destiny 2 reveal this week, when WoW players rushed to start collecting tokens with the knowledge they could eventually be used to spend on Bungie’s new shooter. From a value of 110,596 gold as of May 15, the tokens spiked on the day of the announcement to 140,171 gold. Market activity remained abnormal during peak hours on the following few days before finally leveling out this weekend at a seemingly new normal approaching 120k. This run on the market for tokens amounted to a 26% increase in the value of them, contributing a lot to the monetary device’s ongoing inflation. As the Blizzard Launcher expands its offerings though, and depending on the monetization scheme Destiny 2 employs, the tokens will no doubt continue to go up in value.